... on a jet plane! We are working a half day tomorrow and then jetting off to Italy. Ahhhh! I can't believe we're going. 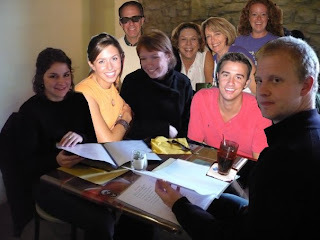 My oh so talented sis-in-law, Emily, photo shopped the travelers into Sally's picture in Italy. This will be what it's like when we get there. I laughed so hard when I saw this picture. We really will bombard Sally and her friends! All you crazies out there, don't be getting any funny idea's about trying to break into our house because these guard kitties will be all over you like a bee on honey. We do have someone house sitting for us and taking care of these sweet ones while we're gone. So no fear of anyone trying to break in. :) Rest assure that I will be back with a vengeance for this blog when I get back. Hopefully, these two pictures will tide you over until we return with all sorts of adventure stories. I will miss you!